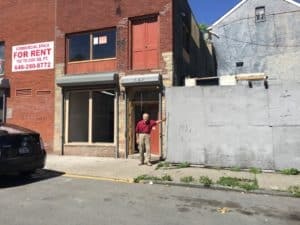 On a recent Sunday this June, 2016, we visited Jeff Link, and his father, Alden Link, at their newly renovated property at 4-6 Clark Street, just off of Broadway, in Newburgh, N.Y. The Link family has been involved in Newburgh real estate for over thirty years and recently purchased this 6500 square foot warehouse which is actually three parcels melded into one. Jeff Link looks towards the ground floor picture window which is brand new and replaces the planks that had boarded up that window for more than 40 years. BE SURE TO COME TO 4 CLARK STREET THIS SATURDAY, JUNE 25th FOR A POP UP GALLERY PREMIER OF WILL TERAN’S POP UP ART SHOW FROM 5 PM TO 10 PM. PAPPARRAZI -TO-THE-STARS: RUSSELL TURIEK, WILL BE ON HAND WITH PHOTOS OF THE STARS HE GLOBE TROTTED WITH. HEAR HIS EXPLOITS, NOSH SOME FOOD AND HAVE A DRINK! It’s important to frame Clark Street’s location. Clark Street is a lovely city street. It runs south from Broadway past Ann Street, proceeds past Washington Street, continues past West Parmenter, and runs straight into a dead end when it intersects St. George’s Cemetery. It’s important to mention the Cemetery because not only is it a significant historic landmark within the East End Historic District (as is the entire street), but it is significant to the street because of the green space buffer, and park-like setting it affords Clark Street. The artful siting of the cemetery, its vistas and views to the river and back to the city, suggest famous landscape architect, Andrew Jackson Downing, may have even had a hand in the design of the cemetery. According to St. Georges Episcopal Church‘s website, Downing and Reverend John Brown who bought the cemetery, were colleagues. And, Downing purchased a plot there for he and his wife. Knowing these details enhances an understanding of Clark Street, and help give context to the beauty, history, and the potential of this street. Other tidbits about Clark Street include the fact that Habitat for Humanity of Greater Newburgh has just completed three Veterans Build homes on Clark Street just off of West Parmenter. 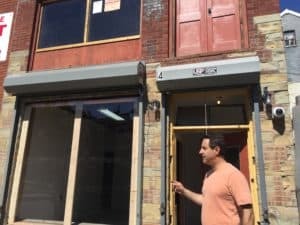 And a couple of blocks down Broadway from the 4 Clark Street property are: the Two Alice’s Coffee Shop; the Ritz Theatre; Will Teran’s Newburgh Gallery; Space Create, and all the shops and restaurants in the hip neighborhood in and around Liberty Street. It’s a neighborhood that just seems to keep expanding. 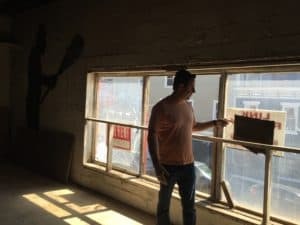 But let’s get back to the 6,500 sq foot warehouse that the two Links are working on and that is being converted into individual, commercial units for artistic, creative and entrepreneurial individuals. It is their goal to provide affordable, commercial work space in Newburgh. 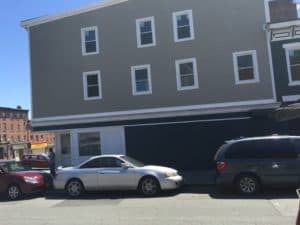 In fact, the property at 4-6 Clark Street has three buildings combined into one, contiguous parcel. Two buildings are accessible from Clark Street, and the 3rd building (which is landlocked) is accessible from an easement that enters from Broadway. Over the last 60 years, tenants have ranged from a plumbing supply distributor, to a night club, a motorcycle club, a karate school and a water softener distributor. Each prior occupant has left a mark on the building, both literally in terms of paintings, designs, disco ballroom floors and fixtures, to the actual attributes of the building, such as the second story loading dock door (visible from Clark Street) which permitted the plumbing supply company to use the small dock to load supplies. The 2nd floor loading dock door had been covered up with plywood and paneling for over 30 years, but is now visible. Picture window out to street on second floor, is adjacent to loading dock door which is now visible but both door and window had been boarded up for over 30 years. This, as Jeffrey is pointing out, is a temporary window soon to be replaced. On the day that we visited, Jeff and Alden invited fellow property owner and Clark Street neighbor Jimmy (Jim) Cooper to accompany us on a tour of the building. Jimmy, a former I.B.M. worker, and his wife, Mary, have lived in a smart, trim and well kept brick building catty corner to the 4 Clark Street property for about thirty years. They’ve seen a lot of changes on their street. As Jeff began overseeing work on the property, he and Jimmy struck up a friendship. And Jimmy shared how pleased he was to see the property undergoing renovation. It seems that Jimmy and his wife (who have been doing restoration work of their own on their property) would often despair of the graffiti, debris, and general dereliction of duty to property maintenance that plagued a few of the buildings on that corner of their street. When Jeff came along and began blasting graffiti off of his building, clearing over a 100 yards of debris out of the building, and working with the city to ensure that neighboring landlords comply with standard property maintenance for the betterment of the entire street, Jimmy couldn’t have been happier, “now it looks better then I have ever seen it!” he exclaimed as we viewed the building’s exterior. Jimmy Cooper, Jeff Link’s neighbor on Clark Street, looks down from his front stoop over the tidy city garden his wife, Mary, keeps. 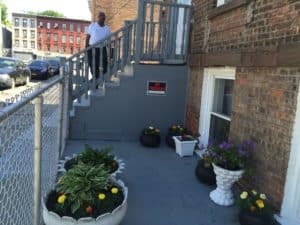 They have been Clark Street residents for more than thirty years and are delighted by the improvements; Jimmy retired from I.B.M about ten years ago and works on restoring his own building. Jeff also bought the adjacent lot, which has been combined into the property offering, and this pleased Jimmy even more, when he saw cleanup happening on that lot, also. Purchase of the lot afforded needed parking, as well as access to one of the land locked units in the configuration. Our tour took us through an interesting labyrinth of the three connected buildings. All units have 10’ ceilings. Three of the units have ground floor access. Each unit is secure and has its own access. The units range in size from 700 to 2,500 sq. ft.
Jeff explained that one of the unique features of the Clark Street location is that is in a retail zone, one that lies just off the corner of Clark Street and Broadway, and this zoning enables tenants to both work and sell their product at the same location. 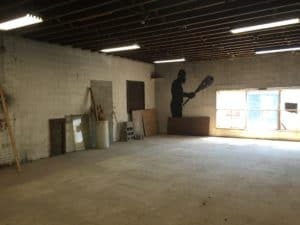 “In calling our warehouse and Facebook page The Newburgh Artist Colony, the goal is create a location that will become a go-to spot for artistic and creative people and visitors alike. The property also has a fenced in vacant yard next door that is available for tenants use,” Jeff said. The property is 1 block west of the Armory, 3 blocks west of the Ann Street Gallery and a 10 minute walk from the Newburgh Beacon Ferry. Units will be available for July 1, 2016 move in. All utilities are separate and individually metered. To book a showing, visit our individual property listing page. And besides all the benefits of the larger neighborhood, the delightful and friendly Jimmy and Mary Cooper will be your new neighbors!